In a David and Goliath battle, the screenplays for Ben Young’s debut feature Hounds of Love and Mel Gibson’s Hacksaw Ridge will compete for the original feature film prize at this year’s AWGIE Awards. That pits a low-budgeted film scripted by Young, which has grossed $125,000 in three weeks at six Australian cinemas, against the $US40 million WW2 drama written by Andrew Knight with Robert Schenkkan, which has amassed $US175.3 million worldwide. There is only one nomination for the feature film adaptation category so the winner almost certainly will be Luke Davies for Lion, based on Saroo Brierley’s memoir. The 50th Annual AWGIE Awards presented by the Australian Writers’ Guild will be handed out in Sydney on Friday August 25. Individual category winners will be eligible for the Major Award, given to the most outstanding script of the year. Past winners have included the writers of The Code (2014 and 2016), The Water Diviner (2015), The Sapphires (2012), Animal Kingdom (2010) and Cloud Street (1999). In the TV series or miniseries category the nominees are Greg Haddrick (Janet King – Playing Advantage), Jacquelin Perske (Seven Types of Ambiguity – Alex), Michael Lucas (The Wrong Girl – episode 3) and Pete McTighe (Wentworth – Seeing Red). In the running for the telemovie or miniseries of fewer than four hours are Kris Wyld and Kim Goldsworthy (Deep Water), Glen Dolman (High Life) and Hoges: Part 1 (Keith Thompson). 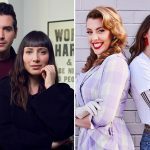 The TV serial prize will see three writers of the Neighbours stable, Sam Meikle, Sue Hore and Peter Mattessi, compete with Home and Away’s Faith McKinnon. The nominees for the situation or narrative comedy award are Trent O’Donnell (No Activity – Silent Night), Josh Thomas, Thomas Ward and Liz Doran (Please Like Me – Burrito Bowl) and Luke McGregor and Celia Pacquola (Rosehaven – episodes 4 and 6). The sketch comedy or light entertainment award will be contested by Declan Fay and Anne Edmonds with John Campbell, Stuart Daulman, Greg Larsen, Jonathan Schuster and Henry Stone (Fancy Boy – Three Wishes), Sam McMillan and Chris McDonald with James Pender (Sammy J’s Playground Politics) and Fabian Lapham (Suspect Moustache – episode 1). The nominees for public broadcast or exhibition documentary are Wayne Groom with Carolyn Bilsborow (Paris or the Bush – The Story of the Cods, Sally Aitken (Streets of Your Town- episode 2) and Edoardo Crismani (The Panther Within). In a record-breaking year for theatre entries, Leah Purcell’s The Drover’s Wife, which was recently awarded book of the year at the NSW Premier’s Literary Awards, is nominated in the stage category alongside Catherine McKinnon’s Hurt, Andrew Bovell’s Things I Know To Be True and Stephen Carleton’s The Turquoise Elephant.